C-Com Satellite Systems provides auto-deploy SNG broadband antennas. Ontario, Canada April 2014: C-COM Satellite Systems has developed proprietary mobile self-pointing, auto-deploy antennas that (while stationary) allow the delivery of broadband satellite internet services into mobile environments virtually anywhere you can drive. 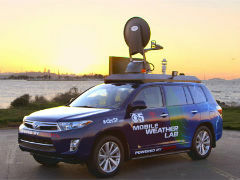 The vehicle-mounted antennas, which come in eight different sizes and interface with a large number of readily available satellite modems, mount easily on top of (or inside) vehicles creating a transportable VSAT platform. The satellite antenna systems are powered by a standard 12-Volt DC car battery or from the local electrical grid. The auto-deploy antenna can be activated with the push of a button or click of the mouse. Once activated, it extends automatically in a few minutes, locks onto the selected satellite and delivers broadband mobile Internet access, VoIP and Video services anywhere in the world.